Give your customers the ultimate deli experience with this clear Genpak AD12 12 oz. 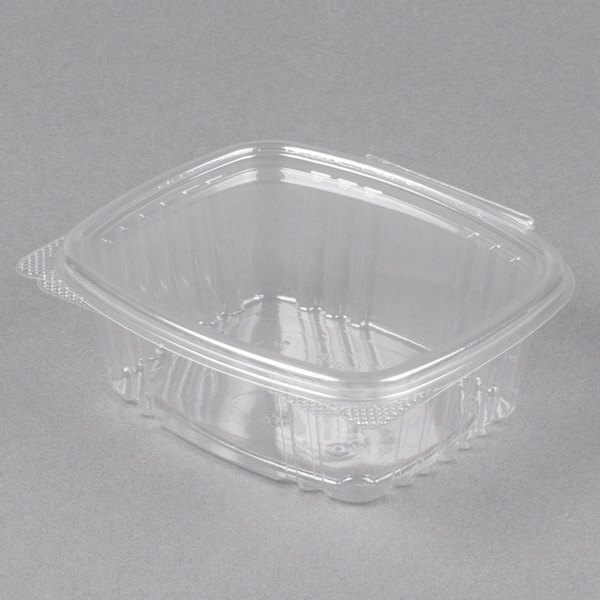 rectangular hinged deli container. Not only will it make your guests happy, but it will make Mother Nature happy too! 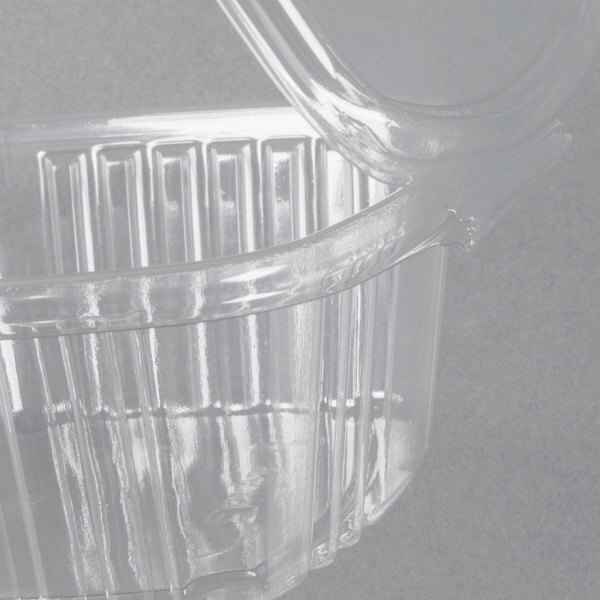 Made from 30% post consumer recycled material, this deli container is a Green Restaurant Association product. This eco-friendly item conserves natural resources, and your purchase will help to sustain the environment for future generations. Genpak's PCR program keeps approximately 350 million plastic water bottles from ending up in landfills every year! 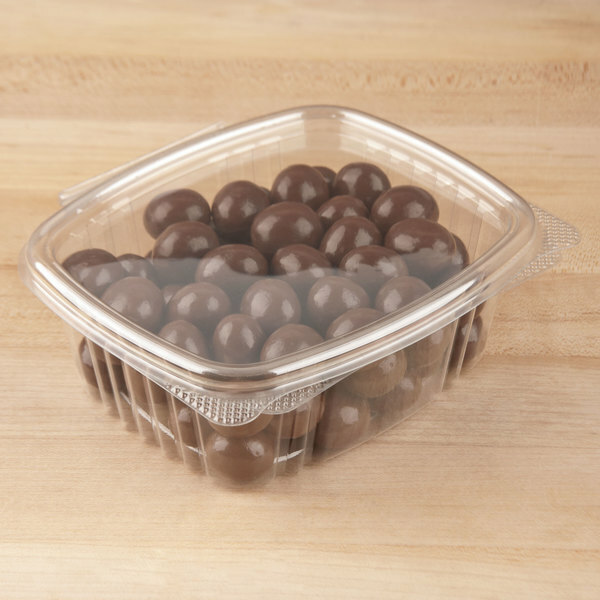 Genpak case of 100 clear hired deli containers are the perfect containers to package bakes goods in for customers to buy. they have nice sealing lid attached by a hinge. I chose these boxes for two reasons, they had an attached lid and I could use them for several different products. They did not disappoint. I used them for baklava (it held 5 of our pieces) and fudge (a 1/4 lb portion) for a holiday market sale. These were perfect. I ran out of them and hit the local supply store for a last minute substitute and they were awful. I ordered a case so I never had to use those substitutes again. Id even explore other sizes should my menu expand. We use these for smaller salads and sides as to go containers. The presentation of product as well as the durability of the plastic are top notch. Had been looking for containers for while to use to put my gourmet brittle in. With some research and found these on Webstaurant. they are perfect, excellent for keeping my brittle fresh for two weeks I believe it will keep it fresher for longer with have to test It out. Excellent product for my need . 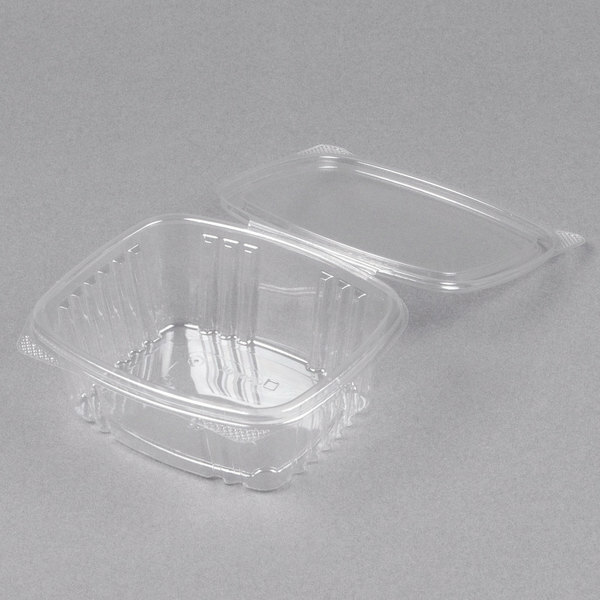 Perfect clear deli containers by Genpak. 200 in a case is a good value. They look upscale and they are convenient with their hinged design. No need for separate lids. This is just as I expected. It is durable and has a chiche appearance. It does not leak!! How great!! As you can tell, I am really pleased. These are the perfect container for slices of sheet cake, brownie, or a few cookies. They are easy to open and close - and they're clear so they show off your product. We use the Genpak AD12 to package our fudge for market fairs. The size is perfect for the portion we serve. 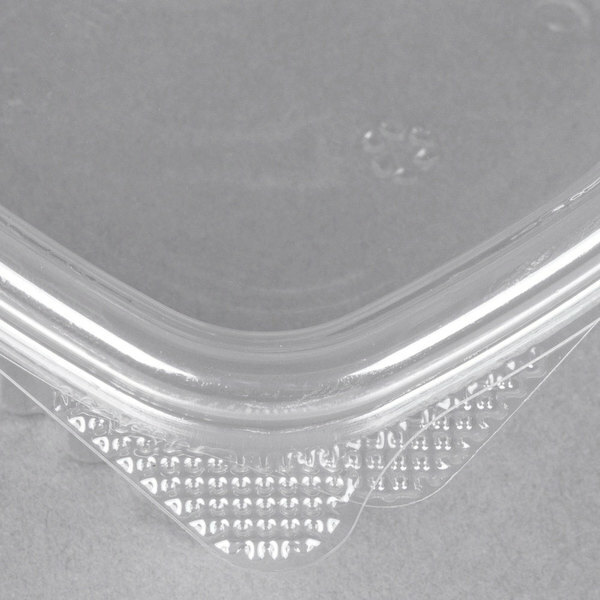 The price for these clamshell containers is excellent! A must-have for any party planners. I use these containers for party favors as they are sturdy and you can see the colorful items inside. You can also use them for dessert/food leftovers to take home after a party. Came across these and decided to try them for a photo shoot. They came out better than I thought. Love the compact and the many ways I can use them. Will definitely buy them again. I use this little boxes for slices of cake and granola. the size is perfect, I have never had a problem closing the boxes or having one of them open suddenly spilling. They close and they stay closed until I open them and that's what I want. Another thing I have never had any of them ( and I buy them often ) break on the hinged part. And on top of everything they stack! We use this container at the bakery for our thicker brownies, cuts of cake, slices of pie,etc. We like to have them in stock daily. This are super nice. Love the way the close I will not be afraid of they opening without wanting to be open. Some of these containers are kind of loose close, but not this ones, they are great. I used them for mini loaf size of lemon cake with glaze and they look cute and hold them perfectly. The quality is amazing and the service outstanding. I like these a lot, BUT they do not hold much. I have to strategically place 5 coconut macaroons in it to fit. I thought they were big enough since I also use the 8oz ones as well. Almost the same size. I use this for my toffee which holds 6oz nicely. Very happy with this product for our retail sales. Hild a good amount of food, clear for best presentation, like that lids are hinged. Recommend thoroughly.